Tangles are the bain of my existence. They have cursed my hair journey for as long as I can remember, causing unimaginable harm to my precious hair goals. With every tangle-related battle I entered, I came out with a greater understanding of my enemy. And each time I re-arm myself with the strategy I need to eventually overcome this great force of evil. *Tangles have the ability to evolve in its more dangerous cousin also known as the "knot." *In most instances when we try to deal with tangles directly, we almost always lose hair in the process. Some of you know that I've invested quite a bit into the acquisition of detangling combs. 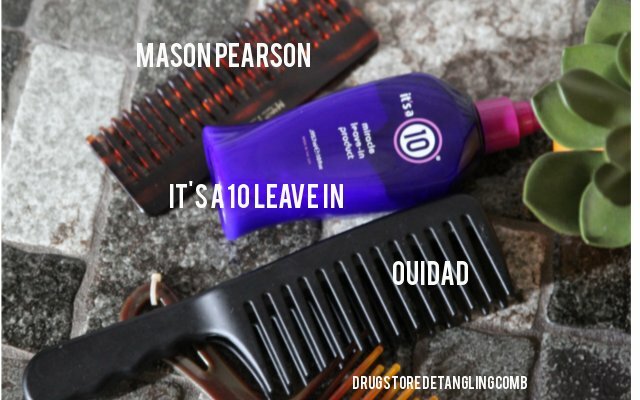 As of this moment, my only comb of choice is the Mason Pearson. To me, it out performs all the combs I own with teeth twice as wide. I suspect it has to do with the smoothness of the comb itself. When I touch my Mason Pearson, it feels slightly oily. This is because the oils from my hair transfer and remain on the comb. Years ago, I had the bright idea of spraying my combs/brushes with oil sheen to help the comb glide through my hair. The results, however, were not as I expected as the oil sheen was too heavy for my hair. With this comb, my dilemma is solved. I also mentioned, once before, that this comb is "quieter" than my other options. By quieter, I mean, that when I'm detangling using short strokes, I can hear my other combs as they move in and out of my hair. To me, a quieter comb means that my hair is under less strain compared to the others. Combs are one thing, but sometimes they can only do so much. When the tangles get out of control, I call in the calvary and go for the big guns. My detangler of choice is "It's a 10 Miracle Leave In." I bought it on a whim after seeing a rave review from Tia Williams on Essence.com. It's a 10 Miracle Leave-In received a 4.5 stars on Amazon out of 679 reviews. That should say something about the effectiveness of this product. Honestly, I've never actually used It's a 10 as a leave-in, I only break it out when I'm ready to go to war against a stubborn tangle or knot. For me, this does the trick. I spray directly on the tangle and soon that thing is pretty much melting away (with the help of my trusty comb). Plus, as I mentioned before, the product I use tends to stay on my comb which makes it even more helpful. *Detangle in the smallest sections possible. Try to separate the hair to where you are only dealing with the identified tangle. *Use the right tool for the job. If you need product to help detangle, make sure you have it handy. Don't just use a comb (or your fingers), have something you can leverage to make the process easier. In my case it's the Miracle Leave in, you can also use coconut oil or other effective detangler. *How much time do you have? 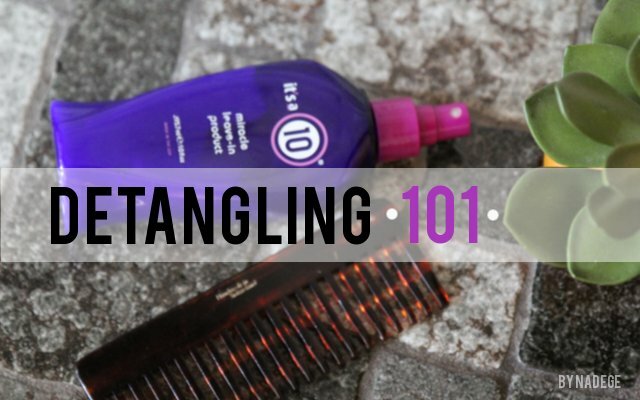 Detangling requires a certain amount of patience. Are you ready to invest the time into a quality detangling session? *Leave it alone! Sometimes a knot gets on my nerves so bad that I just want to rip it out! That's when I decide to retreat, regroup and try again another day. This strategy has saved my hair numerous times. The tools I discussed earlier are helpful in addressing the tangles once they exist but I also understand that it's equally important to act preemptively to avoid the creation of tangles and knots when at all possible. In the past, the source of my tangles would derive from the curly texture of my new growth wrapping around the length of my hair as it shed. When my shedding was high, I had more tangles to contend with. That's when I decided to do something every time I noticed excessive shedding. If you haven't read my post on how to stop shedding. Please do so. Oh, there's more. According to this article, chemically treated hair tangles the most. It could have something to do with the cuticle layer being "open and puffy, like velcro." This sorta makes sense to me. We should strive to create a smoother cuticle layer every time we treat our hair so the chance of tangling decreases. I'll go into a little more detail on smoothing and repairing the cuticle on a future post. Awesome post and timely! I went to war with single strand knots last wash day...and I won! I love my It's a 10! and I'd never thought to use it to melt away knots! Thanks for the idea! I found when I started prepooing with coconut oil,especially overnight, my tangles lessened greatly. I'll have to check it out. I love my combs but I may need something else to help out with the knots towards the end of my stretches. I wasn't detangling the right way untill a couple months ago. I now arm myself with tangle teezer, a wide tooth comb and two products. 2. I then put NTM Leave in on top and begin to comb. My hair is over 3 feet long and very thick. I have been searching for YEARS for a good conditioner that would make brushing my hair post-wash easier. The Shielo Smoothing Conditioner & Smoothing Collection is amazing. I have no tangles in my hair after washing and my hair looks and feels great. I would suggest anyone with long, color treated, or dull hair give Shielo Smoothing a try.